News Corp. chairman and CEO Rupert Murdoch will remain in control of the separate entertainment and publishing companies following the News Corp. split. NEW YORK (CNNMoney) -- News Corp. confirmed Thursday that it is planning to split into two publicly traded companies, with one company for its television and film assets and the other including its publishing entities. News Corp. said that its board "authorized management to explore this separation" after a meeting on Wednesday. The split would separate the 20th Century Fox film studio, Fox broadcast network and Fox News Channel from newspapers and book publishing. News Corp.'s (NWS) publishing unit owns newspapers such as The Wall Street Journal, The Times of London and The New York Post. Its book publishing assets include HarperCollins. Once the split is completed, Chief Executive Rupert Murdoch will serve as chairman of both companies, according to News Corp. Murdoch will also serve as CEO of the media and entertainment company and Chase Carey will serve as its president and chief operating officer. Carey is currently the COO of News Corp.
0:00 /2:16Murdoch must split News Corp. The company did not announce who will be CEO of the publishing company, which would be less than one-third the size of the media/entertainment company. In its most recent quarterly earnings report, News Corp. said that revenues from its cable network programming, filmed entertainment, television and direct broadcast satellite TV added up to $6.2 billion, compared to $2 billion from publishing. In a call with analysts, Murdoch dismissed "naysayers" who would interpret the announcement as cause for concern about the long-term prospects for publishing. 'We expect the publishing company to enter the world as a standalone entity with a very strong balance sheet," Murdoch said. He added that the publishing company will focus even more on growing its digital business. Murdoch said the split will take about 12 months to go through, assuming that it is approved by the board and shareholders. When asked to identify the potential hurdles that the company faces in completing the split, Murdoch replied, "Lawyers - there's a short answer - and governments." Media magnate Murdoch has been hounded in recent months by criminal investigations into his company over hacking into people's phones and improper collusion with British police. The scandal prompted News Corp. to shut down its venerable U.K. tabloid News of the World last year. A report last month from a British Parliament committee said that Murdoch was not a "fit person to exercise the stewardship of a major international company." 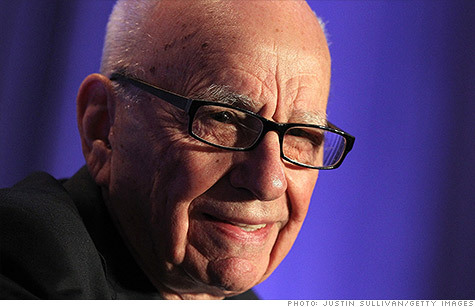 Shares of News Corp. were flat on Thursday. The stock is up 11% since News Corp. confirmed reports Tuesday that it was considering a split. Thanks in part to the break-up news, News Corp. has outperformed the shares of most of its other media rivals this year. Its stock has done better than CBS (CBS, Fortune 500), Viacom (VIAB, Fortune 500) and CNNMoney parent Time Warner (TWX, Fortune 500). However, shares are slightly lagging the year-to-date returns of Walt Disney (DIS, Fortune 500).